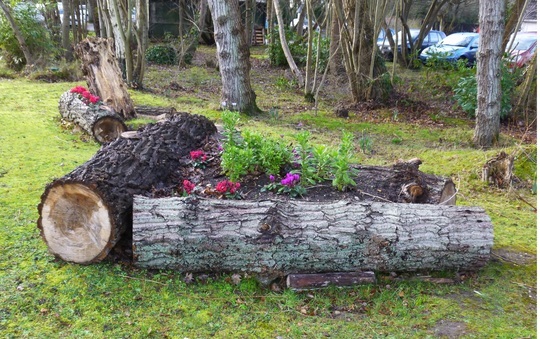 We saw the following planting and novel ideas for old tree trunks in the grounds of a hotel last week. 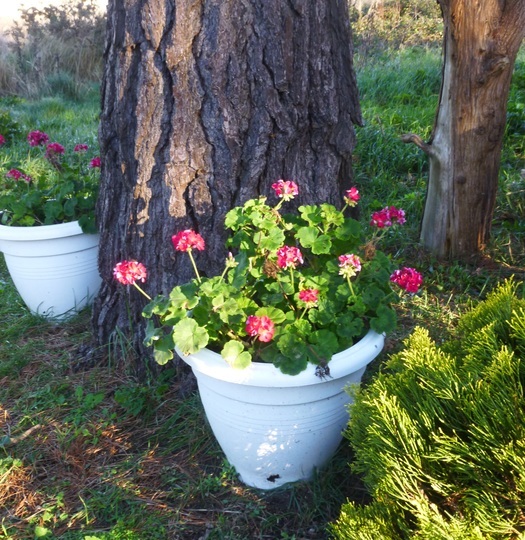 The hotel gardener assured us these Pelargoniums have been flowering for months! Hopefully the snowfall last week, only overnight thank goodness, has not damaged them. Previous post: A warm bath outdoors! Some great ideas there they look great I like the log planted up. As the Pelargoniums are sheltered by the tree I would of thought they would be OK. I use broken planters too, they can be useful for shallow rooted plants and/or succulents. some lovely ideas here aren't there? Thanks 3d and Sbg, I think my favourites were the thatched tree stumps! Shirley Tulip: The thatched items would fit in beautifully with the thatched cottages around here. I agree with you Eirlys, they certainly would! 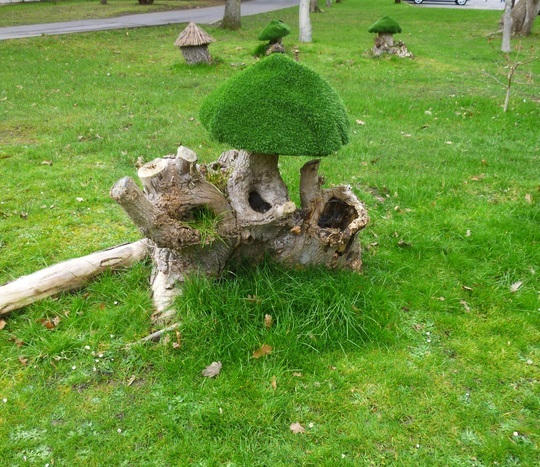 They certainly have a gardener with imagination! 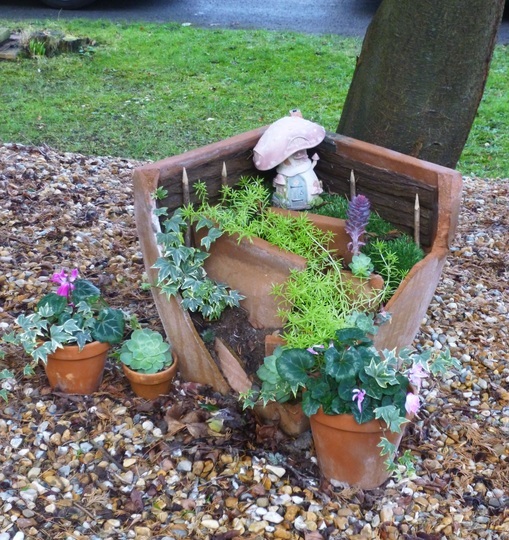 (and time...the broken pot idea at least will need lots of attention - its great isn't it? Was the hotel in your part of the world Shirley? Looks as though its somewhere fairly mild. Stera, just South of Portsmouth ... a place called Hayling Island. It snowed a little overnight on Thursday but was thawing by mid-morning. I really like the broken pots arrangement. Hywel, it put a smile on my face to see those in the gardens! Great ideas there Shirley. I especially like the log planters. Rose, they're just a little bit different aren't they? Hello Sue, hope you're keeping well. 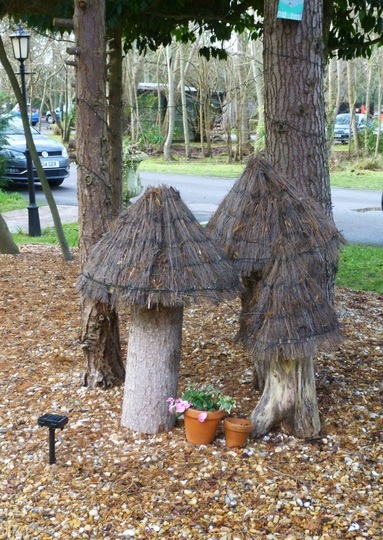 I wish I had asked the gardener how those tree toppers were made as I really like the thatched ones. The green ones are fake grass which I see a carpet shop near us is selling! Some really good ideas there, I do love a bit of quirkyness if there's such a word........such fun!! Thanks Dotty ... quirkiness is a fine word!! !